Butch grew up playing sports at a very young age in the Pasadena/Glen Burnie area. He excelled in soccer through high school and college and continued to play competitively through the bulk of his 20’s. After competitive soccer was over his life was missing that competitive push and team camaraderie that was always there. He then turned to a gym where he lifted weights by himself while listening to headphones and would maybe jump on a treadmill here and there until that quickly became boring. While at the gym he started playing around with CrossFit-esque workouts and started to enjoy the gym again. 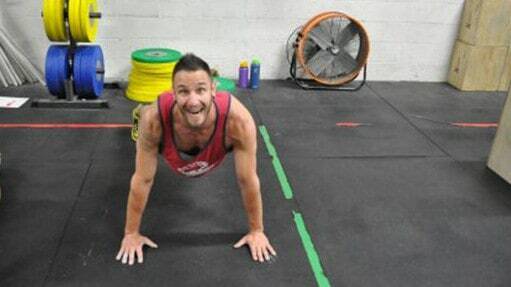 Soon after he joined his first CrossFit gym in Baltimore City where he was hooked immediately. No more void. 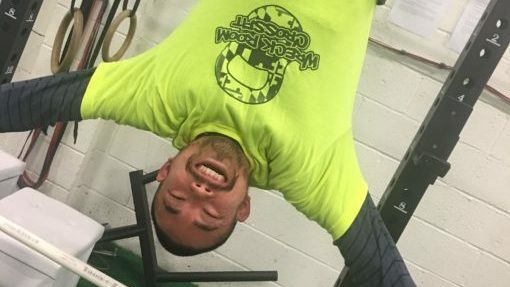 It didn’t take long before he learned a lot and found himself helping others more and more to the point that he was spending a couple hours every day after work for almost two years teaching CrossFit to a group of friends at a Gold’s Gym. That quickly turned into wanting to help more people on a larger scale which became Wreck Room. When I’m not working or doing CrossFit…..
As an Affiliate Owner my life is CrossFit but when I do get some time away it usually involves the couch, TV, Magan, and Mac (my pup). It is the most miserable, fun, challenging, exciting, and rewarding thing I have ever done. My best CrossFit moment was….. The day I opened Wreck Room. That or the day I started! Helping others is the best feeling in the world. My favorite coaching moment is….. Bright Spots Friday. This happens in our Wreck Room Facebook group where every Friday everyone posts all their successes and wins from the past week. Not just workout related but family, hobby, or work related. Toes to bar or rope climbs. Gymnastee! My least favorite movement is….. Growing up, Brittany was always interested (and still is) in the following: music, gaming, and anything involving a computer. Throughout her life, she wasn’t very active. The most activity that she would deal with was being a color guard for her local marching band during her high school years! Though marching while twirling a flag was cool for a while, Brittany eventually became bored of the activity and quit a couple of years after taking it up. For years following that, she mostly lived a pretty sedentary lifestyle. Fast forward to 2012. While working for a government contractor, some of her work buddies decided to start an office ‘Biggest Loser’ challenge. Brittany decided that this was her chance to drop some pounds, so she jumped right in. She ended up winning that challenge by dropping a little over 40 pounds during the 4 month period. Loving the way she felt, she continued to stick to her newly found fitness and nutrition regimen after the challenge ended. She began taking various fitness classes to find her ‘thing’. She eventually fell into CrossFit in 2013. Her first CrossFit WOD was “Filthy Fifty”. It hurt, kind of sucked, and her arms wouldn’t stop shaking after it FINALLY ended (blame the 50 burpees), but for some reason she loved it. There were so many fun, and not so fun, movements that were cool to learn. But, what really stood out for her was, even though she was the last one working out, EVERYONE in the room cheered her on! Learning and being apart of an amazing community of like-minded individuals drove Brittany to wanting to coach CrossFit. When I am not working or working out…..
Gaming! Comic books! Web development! Lol, I am and will always be a nerd. It’s always interesting and the workouts are typically never the same. 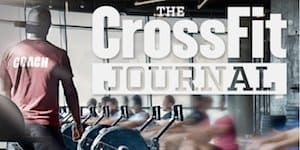 Plus, with CrossFit comes a unique and highly supportive community. There’s nothing like it! I could easily say that hitting a PR deadlift or back squat would be one of my best moments because I just love lifting heavy. But, my best moment was when kipping pull-ups finally ‘clicked’ and I was able to do ‘Fran’ RX. Took me forever, but I did it! Nothing beats the feeling of helping people to achieve. Whether if it’s them getting their first double under or full rope climb, being apart of those moments is exciting! My best coaching moment is…..
My best coaching moment was helping a member get over her fear of box jumps. She had a pretty nasty incident a while back with them, so whenever it was time for box jump workouts, she would only do step ups. 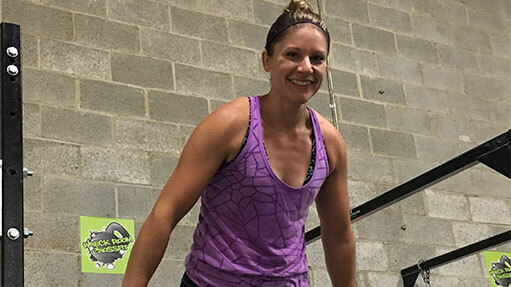 I knew that she was fully capable of doing 20″ box jumps, but we started progressing slow with lower box jumps and safety tweaks that made her feel confident throughout the re-learning process. Eventually, another box jump workout popped up. She rocked it and got one of her first RX scores! We were both freaking out at how much she progressed; it was crazy! The deadlift. It’s simple yet, a little complicated and crazy powerful. Running. I mean, do we REALLY have to do this? My favorite cheat meal is…..
Pizza, wings and french fries… all on the same plate. Yup. Being healthy and staying active are extremely important to her and her lifestyle. 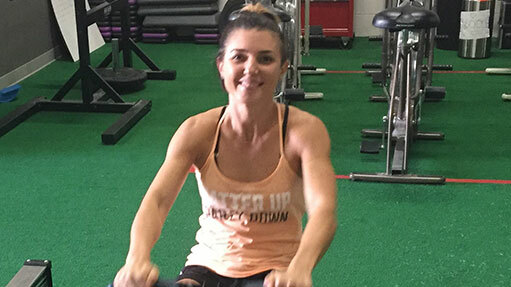 Ever since she started her fitness journey, she has set short term and long-term goals to keep herself accountable and stay on track. When she was younger, she played softball through high school but once she graduated, she really started to focus on competing. She ran 5Ks, 10Ks, and half marathons religiously. She also did a number of mud races and competed in a few triathlons. After a few years of racing, she then moved into the body building community and competed in figure competitions for 2.5 years. Each sport has taught her something different and led her to CrossFit. When I am not coaching at Wreck Room, I am teaching middle schoolers how be become healthy and active individuals. I am a Physical Education and Health teacher at General John Stricker Middle School. I wanted to become a Physical Education Teacher so our youth will recognize how important it is to make healthy lifestyle choices. Hopefully they will start this healthy lifestyle throughout their school-age years and maintain it into their adulthood. If they realize how important it is to take care of their bodies now and act upon it, then I have succeeded as an educator. I truly believe CrossFit is a lifestyle sport. Every movement we do in each workout is useful in everyday life. The workouts are always changing and there is always going to be something that I can improve on. I not only Crossfit for the killer workouts, I also Crossfit because of the community. Wreck Room takes pride in our community but it doesn’t stop there. The CrossFit community around the world is its own community. We all share a common interest in not just the workouts, but the challenge it takes to complete them. My best CrossFit moment is….. The first big goal I hit was probably a kipping pull-up. I was able to do regular pull-ups but involving the kip somehow made it 10x harder for me. When I used to train for competitions, we focused more on lifting weights and building muscle. Hitting a PR weight didn’t do as much for me if I were to compare it to gymnastics. I also remember consistently getting my first set of double-unders. I used to take my jump rope to LA fitness and practice a couple days a week until I could get them down. Accomplishing that was a huge goal as well. I love to see people succeed and accomplish goals. Whether it is losing weight, getting their first double under or cleaning 200 lbs. It brings me so much joy to see faces light up because a goal was achieved. It is truly a privilege to help with their journeys. Handstands and handstand push-ups are two of the hardest movements for our members to overcome. I remember walking someone through the handstand push-up stages and she got her first one just following my cues. It was a huge moment for her but it was also a huge moment for me because I helped her do it. I remember jumping up and down for her after she extended. That was a great moment. Surprisingly kipping pull-ups and snatches. Although my snatches always need some work, I really enjoy the movement. Toes to bar. I have yet to feel really accomplished with them. Emmanuel initially heard about CrossFit in 2007 and eventually tried his first workout in 2008. Throughout college, he was always interested in exercise and how the body responded to physical fitness, from there he graduated with a Bachelor of Science in Exercise Biology. After college, Emmanuel joined the Navy and served for six years on active duty. During those six years, Emmanuel got more heavily involved in the strength and conditioning community, nutrition, and CrossFit as a whole. After separating from the Navy, Emmanuel continued to help others through service by volunteering at local events, going on humanitarian missions, and coaching at a facility out of his garage. He continues to strive to help others achieve their goals and looks forward each day to every opportunity he is given to help others. I’m usually reading books, surfing the web, or learning/studying for school. It blends community and fitness together in a never ending journey that helps you to live a better, healthier, and happier life. Getting my first ring muscle-up. I enjoy the teamwork involved in helping someone realize and achieve their goals. When an athlete learns a movement it is incredibly rewarding because it means that they will use that exercise to live a longer, healthier life. Helping one of my athletes get her first strict pullup and also seeing her progress to getting three strict pullups consecutively. Both moments were tied for best moment! Ice Cream, all of it. Magan grew up in Pasadena, MD, currently lives in Glen Burnie and owns a Studio in Annapolis doing massage and skincare. In High School I played Tennis and Softball, and also played on a travel league. After High School I was mainly just a gym buff until a group of friends asked if I wanted to try CrossFit. We were lucky enough to know Butch who was more than happy to introduce us to CrossFit exercises at the local Gold’s gym and the rest is history! When I’m not doing either I’m usually hanging out with my dog and boyfriend or my Wreck Room friends. It’s unlike anything I’ve ever done before. I get to see results, I don’t have to plan my workouts and I get to work out with a great group of people. I’ve never been in better shape! Is probably when I got my first strict pull-up, I never imagined being able to do that. I like helping people. Knowing someone is reaching their goals or improving themselves because of my help is a great feeling. Will always be helping a member achieve that “first” of something as I did. Anything from pizza, to nachos, to a burger and fries! It’s always changing!